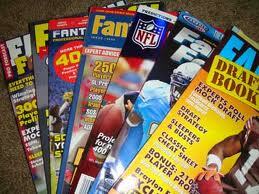 The fantasy football magazine business. Those things usually come out in mid summer, as they all try to get the jump on each other and be the first one to hit the news stands. By the time the season is ready to begin the magazines are often out of date. Well this year they must all be pretty much useless. So many players changed teams after the lockout ended that you'd have to be crazy to make your picks based on a magazine printed last month. And while I'm on the subject, do people even read magazines anymore? I have about 6 months worth of unread ESPN The Magazines (I got a free subscription) sitting on my kitchen counter. Any time that in the past I may have spent reading a magazine I now just use my cell phone/mini-supercomputer instead.